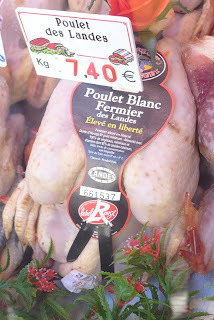 Market Walk near Les Halles - Not for Vegetarians! his master and a very attentive dog. When Stéphane and I found out that we were moving to Paris, we decided to get into the mood by reading Emile Zola's novel, The Belly of Paris, that is set in Les Halles, the enormous (21 acre) marketplace that was built by Baron Haussmann in the 1850s. "Departure of Fruit and Vegetables from the Heart of Paris"
Even though the old market no longer exists, Françoise Meunier's informative tour of the area around Les Halles and le Rue Montorgeuil was like taking a trip back in time to the days when there used to be an opening bell and a closing bell at Les Halles, just like at the New York Stock Exchange. All trading ceased at the sound of the closing bell ("cloche"), which is when the tramps, or the "clochards", could collect the scraps of food off of the ground. Françoise, who used to run a cooking school in the area and still gives cooking classes, gave us lots of good tips about where to buy the freshest ingredients. Addresses are at the end of this post. Enjoy the tour! Stohrer's, the oldest pastry shop in Paris, opened in 1730. Be sure to look at the ceiling. The chicken with the red label is very good, while the Bresse chicken is excellent and should be served with a wine of equal quality according to chef Françoise! Don't worry about the feet. 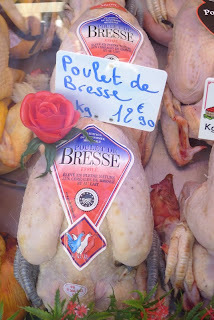 They leave them on to keep the chicken fresh and are removed when they are sold. "Péche" means that the fish has been caught, in this case in the Atantic, rather than farm raised. And beef is always in season in Paris! Bourse de Commerce (Chamber of Commerce) to see the domed ceiling and paintings. 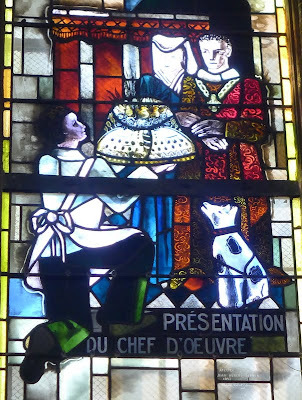 Sainte Eustache to see the sculpture, The Depart of Fruit and Vegetables from the Heart of Paris, 28 February 1969 by Raymond Mason and the stained glass windows given to the church by the Association of Pork Butchers. 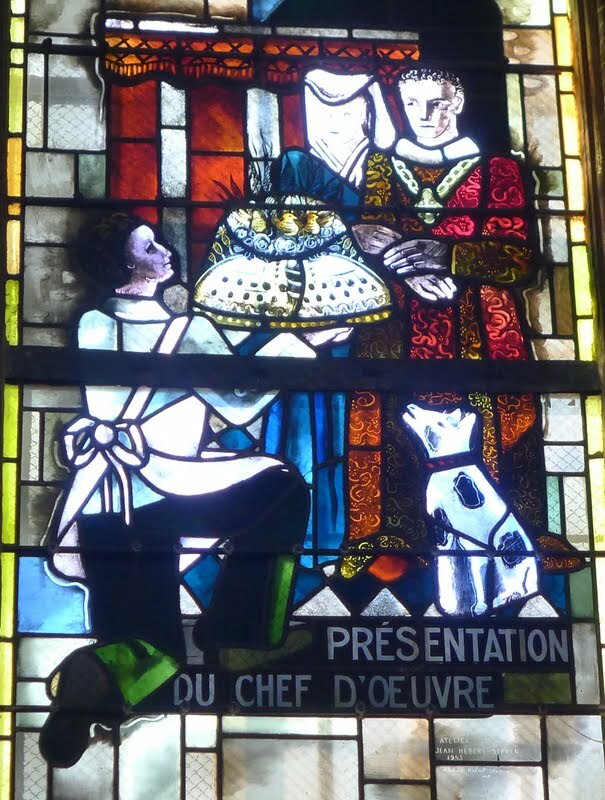 The Christ inn's Bistrot at 15, rue Montmartre is in a building that is classified as a heritage site of Les Halles. Take a look at the tile murals inside. Stohrer, the oldest pastry shop in Paris. Started in 1730, it's older than the USA and supposedly has the best eclairs. After visiting several of the food stores along the rue Montorgueil and smelling the aroma of roasting chickens at the butchers, I was ready for lunch! A Hermès Scarf for €1! 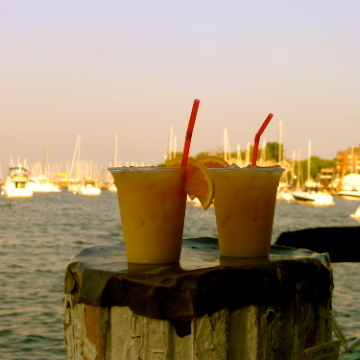 Out and About -- But not in Paris! Does Anyone Want a Free Massage? Comédie-Française - "A Streetcar Named Desire"